Untethered iOS 5 Jailbreak for iPhone 4S & iPad 2, released first for Mac, now for Windows and Linux users too. The ridiculously complex combination of exploits-within-exploits that make this iOS jailbreak possible have consumed thousands of hours of brain-power & effort from a legion of world-renowned hackers, several of whom have been working diligently on this project since the dual-core A5 processor was unveiled by Apple last March. To use it, just download the Absinthe app / program. Launch it, and click “jailbreak.” You need to be on iOS 5.0 or iOS 5.0.1. 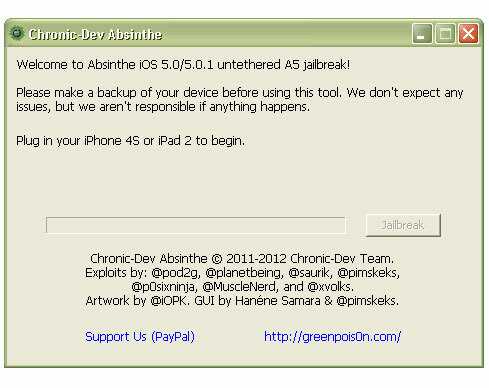 Mac users, if you are already jailbreaked with Absinthe, then no need to use the new version. 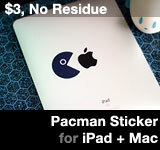 and feel free to buy some ObamaPacman stickers. Greenpois0n iOS 4.1 Unthethered Jailbreak Download Released, Real or Fake? This entry was posted on Saturday, January 21st, 2012 at 8:26 pm	and is filed under iPad, iPhone. You can follow any responses to this entry through the RSS 2.0 feed.